Originally the band called themselves the Tremilos, and had no lead vocalist. They came together while all still pupils at Park Modern School in Barking, Essex. Somewhat arbitrarily, Brian Poole was selected for the role of lead singer- as he wore suitable glasses he most closely resembled the group's idol, Buddy Holly, who they'd seen perform live at the East Ham Granada in 1958. They had to wait until 1962 for the opportunity to record for the first time under their own name at Decca- although they had previously recorded for the studios as backing musicians for other artistes. Stories that the group had been chosen at audition in preference to the Beatles- who were indeed turned down by Decca at that time- are apocryphal. To further complicate the relationship with the Beatles, Brian and the Tremeloes' first hit big with "Twist And Shout"- a song first recorded by the Isley Brothers, but now associated with the fab four because they took the song to #2 in the US chart. However, in the UK the title appeared only on a Beatles EP and it was Brian Poole and the Tremeloes who took the chart honours. A series of hits followed this success including their splendid #1, "Do You Love Me". The link with Buddy Holly was then further strengthened with the release of 'Someone, Someone' in 1964. This was a song presented to them by Holly's former manager Norman Petty who also played the piano on the disc. Although the EP illustrated here isn't a UK issue at all- and my copy is even a bit smudgy- I could not resist including it. It has the rare treat of showing a great picture of the group in the recording studio. It's actually an Australian issue that I obtained from folks "down under" and has the tracks: Do You Love Me/Keep On Dancing/Twist And Shout/I Can Dance- so quite unrelated to any UK issued EP. As for what new 45 they were recording- your guess is as good as mine. Despite the group's success, Poole decided to break away to start a solo career and, perhaps unexpectedly, the group continued to be successful chartwise into the 1970s without him, even chalking up a further #1 and #2. Poole eventually retired for a while and returned to run the family butcher's shop as well as his own record company, Outlook Records. However, he returned regularly on the 1960s revivalist circuit with a new set of musicians calling themselves 'Brian Poole and his Tremeloes'. 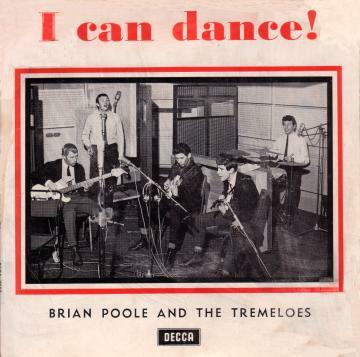 One of Brian Poole's later recording projects also had great success. Having recruited four other "Stars of the Sixties" - Reg Presley (Troggs); Mike Pender (Ex-Searchers); Tony Crane (Merseybeats) and Clem Curtis (Foundations), they became The Corporation (or more affectionately known as The Travelling Wrinklies). Their first single was the old Showstoppers hit, "It Ain't Nothin' but a Houseparty". Brian Poole has become increasingly involved musically in recent years and at the time of writing regularly tours worldwide with Gerry Marsden (Gerry and the Pacemakers) Mike Pender (Searchers), Mike D'Abo (Manfred Mann) and Dave Berry as the stars of 'ReelinandaRockin'. Decca DFE8566 1964 "Brian Poole And The Tremeloes"
Decca DFE8610 1965 "Brian Poole And The Tremeloes"